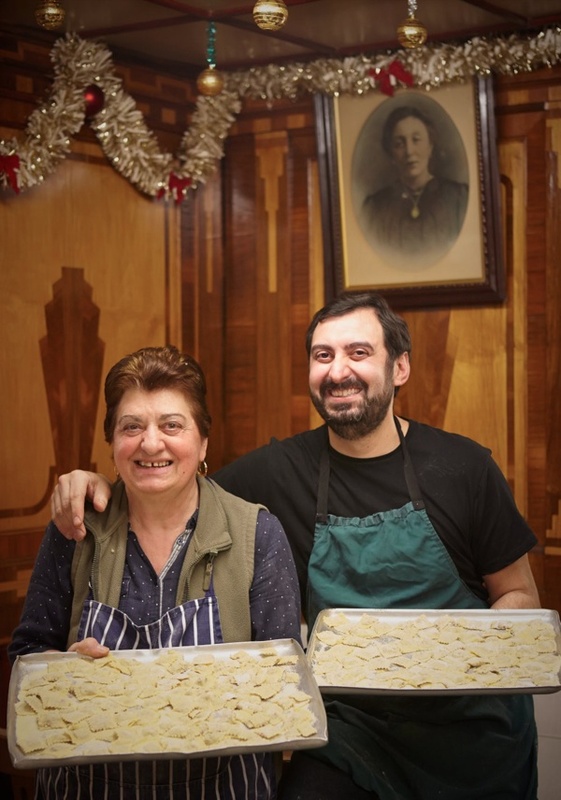 If you should spot a light, gleaming after hours in the back kitchen at E. Pellicci in the Bethnal Green Rd at this time of year, it will be Maria Pellicci making the Christmas ravioli for her family as she has done each year since 1962. Maria originates from the same tiny village of Casciana near Lucca in Tuscany as her late husband Nevio Pellicci (senior). 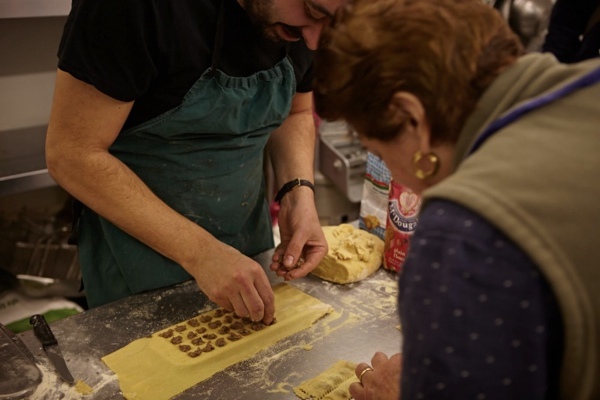 And, to her surprise, when Maria first arrived in London she discovered his mother Elide Pellicci, who came over in 1899, was already making ravioli to the same recipe that she knew from home in Italy. Elide is the E. Pellicci celebrated in chrome letters upon the primrose yellow art deco facade of London’s best-loved family-run cafe, the woman who took over the running of the cafe in the thirties after the death of her husband Priamo who worked there from 1900 - which means we may be assured that the Christmas ravioli have been made here by the Pelliccis in this same spot for over a century. Thus it was a great honour that Contributing Photographer Patricia Niven & I were the very first outsiders to be invited to witness and record this time-hallowed ritual in Bethnal Green. But I regret to inform you that this particular ravioli is only ever made for the family, which means the only way you can get to taste it is if you marry into the Pelliccis. 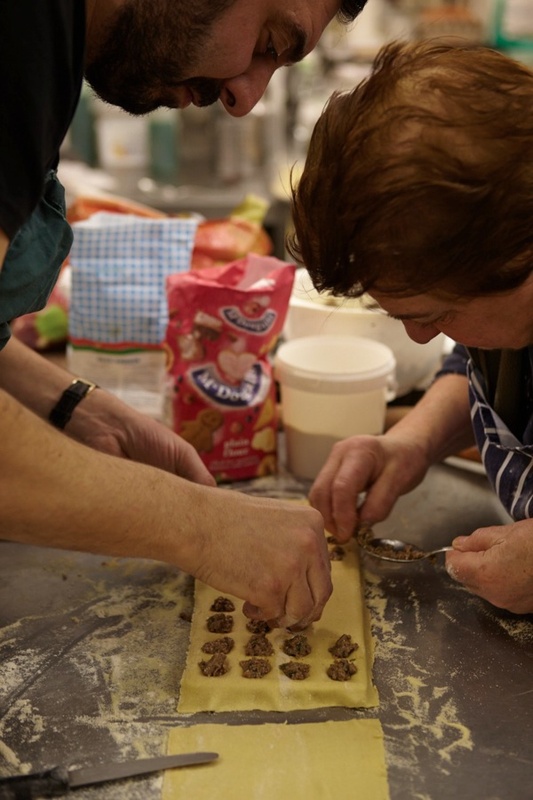 In recent years, Maria has been quietly tutoring Nevio in this distinctive culinary art that is integral to the Pellicci family. “I was going with the boys to see Naples play against Arsenal tonight, but that’s down the drain,” he declared with good grace – revealing he had only discovered earlier in the day that his mother had decided the time was right for making the special ravioli, ready for the whole family to eat in chicken broth on Christmas Day. “She’s trying to hand it over to me,” Nevio confirmed proudly. 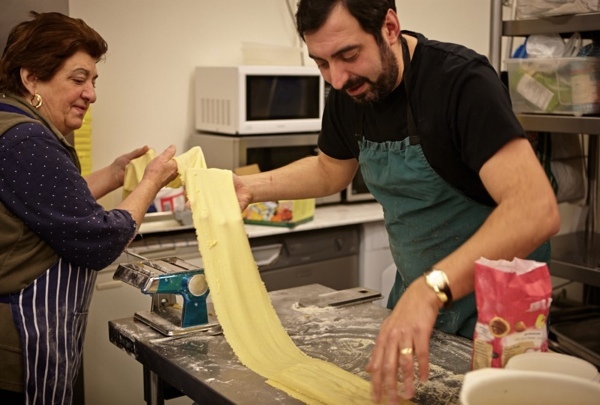 “Nevio’s good and he’s got the patience,” Maria added encouragingly, as Nevio lowered the pasta carefully onto the ravioli mould. 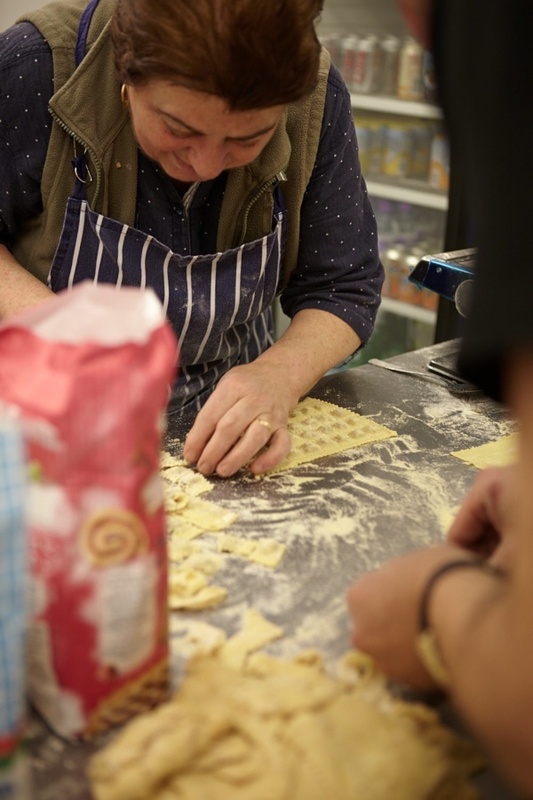 “I’ve got the rubbish job, I have to fill the ravioli,” he complained in mock self-pity, grinning with pleasure as the two of them set to work with nimble fingers to fill the ravioli. 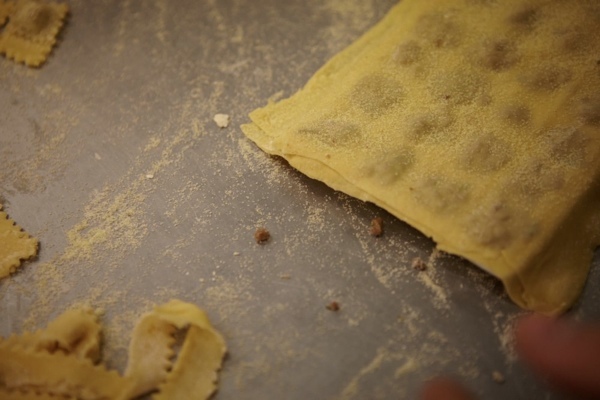 Although the precise ingredients are a fiercely guarded secret, Maria confided to me that the filling comprises beef and pork with Parmigiano and Percorino, along with other undisclosed seasonings. “Everyone does it differently,” she confessed modestly, making light of the lifetime of refining that lies behind her personal recipe. 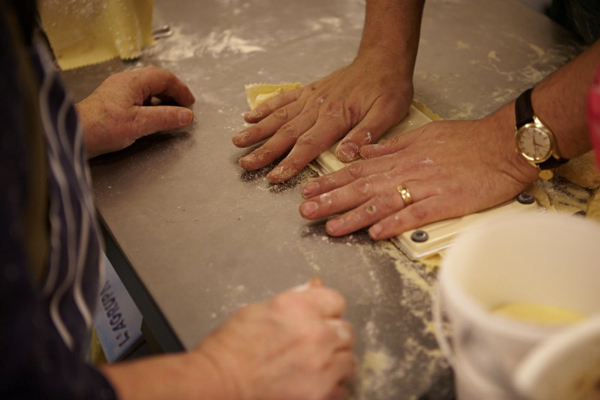 It was Nevio’s task to turn the mould over and press it down hard onto the table, binding the layers of pasta together. 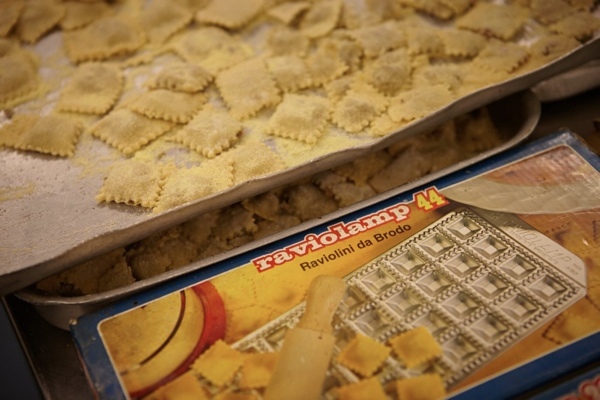 Then, with intense concentration as Maria waited expectantly, he peeled the ravioli away from the mould, revealing a sheet that looked like a page of neatly upholstered postage stamps. 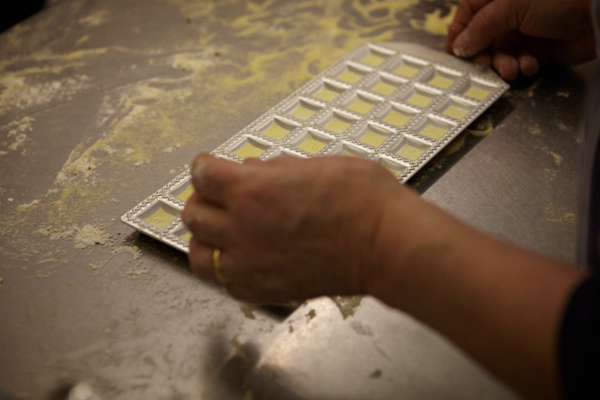 Making swift work of it, Maria wielded her little metal wheel by its wooden handle, separating the individual ravioli and transferring them to a metal tray. In the kitchen of the empty restaurant, mother and son surveyed their fine handiwork with satisfaction. 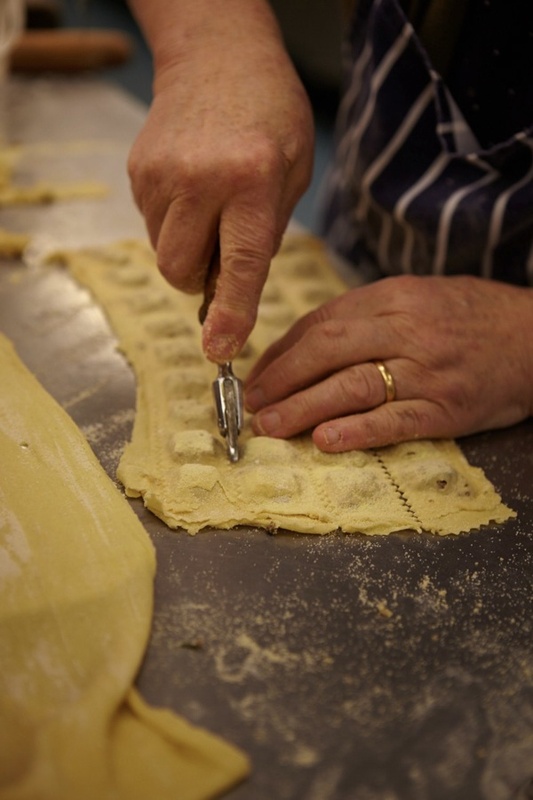 Each mould produced forty ravioli and, in the course of the evening, they made eight batches of ravioli, thus producing three hundred and sixty ravioli to delight the gathered Pelliccis on Christmas Day – and thereby continuing a family tradition that extends over a century. 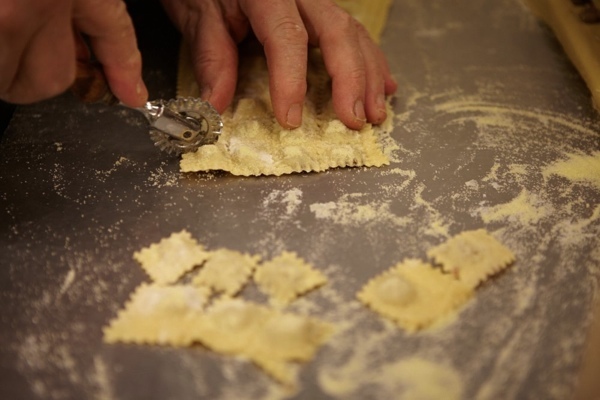 Yet for Maria, Ravioli in Brodo is more than a memento of her origin in Tuscany, making it here in the East End over all this time incarnates this place as her home. 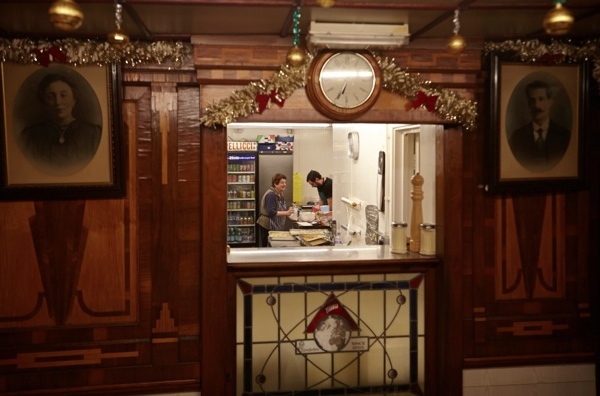 thanks to you and the pellicci family for sharing this lovely intimate moment with us. a true work of amore. Lovely, lovely, lovely. What a heartwarming family story – just what we all need to hear just now. 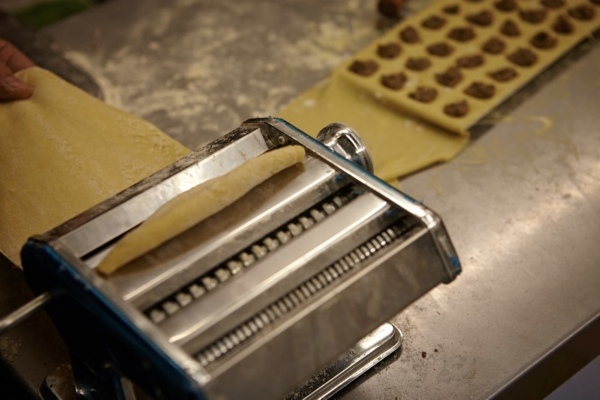 Just one thing, if they made 360 ravioli they made nine batches. What a life affirming article, a reminder of the true essence of life. The Tuscan sunshine glows from a kitchen on the Bethnal Green Road. Many thanks, you have again warmed up my day. Great photos, simply executed, all that is vital is captured. Especially the one with both sets of hands filling the cases. It gently prompts me to spend time with my loved ones. Lovely moments between a mother and son. A bit of kitchen-quiet in our amped-up world. 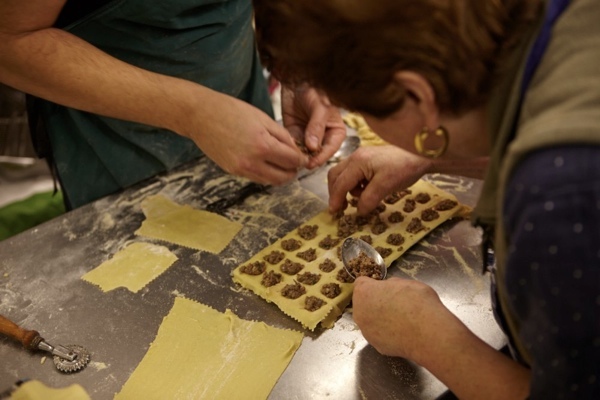 Question: how do they keep the ravioli until Christmas? Freezer? Buon Natale to the Pellicci Family from Canada! My goodness, Maria must have drunk from the fountain of youth. I dare not ask a lady’s age but if she took over the business in the 1930′s, she is looking good! Ah…Elide is Maria’s mother in law. Silly me. I enjoyed reading of this family and was reminded of how Christmas and Eastertide are so significant in keeping traditions alive for believers and non-believers alike, bringing significant ritual and meaning to family life. Perhaps this is why Christmas is such a difficult time for those without families. merry christmas, lovely pellicis, enjoy. 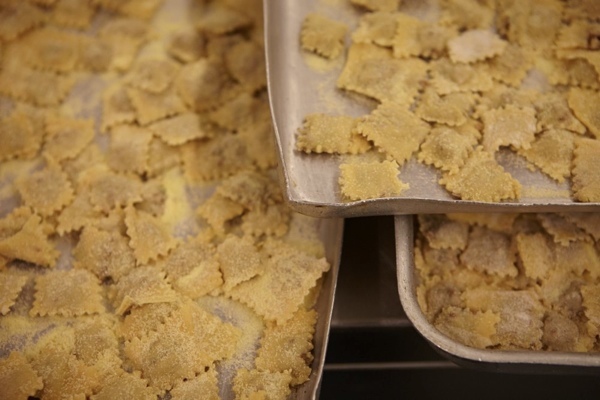 best wishes for 2016 and another century of raviolini.